Self-driving vehicles finally arrive. But so do the terrorists. A thought-provoking thriller about artificial intelligence and the self-driving revolution. You'll be forced to consider how you'd react if you were cornered and trapped in a terrifying life-threatening situation. Fed up with slogging through the treacherous LA traffic to get to work, Jake Bendel and a cunning team of experts create a roadway system for self-driving cars -- preventing thousands of traffic deaths and reducing commute times from hours to minutes. For three months, no traffic congestion. No accidents. No fatalities. People finally feel safe in their cars. But should they? Especially when the dark side of humanity sees this as a chance to destroy the United States. A Syrian terrorist group weaponizes the system and devises a scheme to kill more Americans in one day than the 407,000 + U.S. soldiers killed in World War II. Viktor, a tormented psychopath and the mastermind behind this ruthless attack, is driven by the voices of his dead mother and Allah ...who guide his every move. While he and his brothers mercilessly annihilate Americans in the name of the Jihad, Viktor plants evidence that convinces the public Jake is the architect behind the most heinous terrorist attack in U.S. history. But one rogue FBI agent believes Jake is innocent. Together they unearth a mole deep inside the FBI, go off the grid, and hash through a trail of hidden clues to stop Viktor from slaughtering millions of unsuspecting American drivers in a matter of minutes. The clock is ticking. Can they stop him in time to prevent another savage bloodbath? 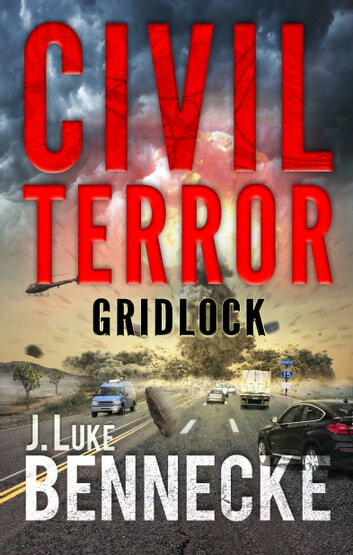 Civil Terror: Gridlock will grab you by the throat and pull you into a vicious struggle that will define the fate of the world for generations to come. If you like Dan Brown, Tom Clancy, or Jon Grisham, you'll love J.Luke Bennecke.